Noise is false data due to extremely small electrical signals that are not generated by light from the scene but are caused by interference or energy from other sources. It’s the demon of all digital photographers. It’s the digital analog of film grain. The primary source for imaging sensor noise is heat. This is why the most sensitive sensors in powerful telescopes are cooled to extremely low temperatures, often by liquid helium, to temperatures close to 270°C (-454°F). Sensor noise, exaggerated for clarity. Image should be totally black. Click for larger image. 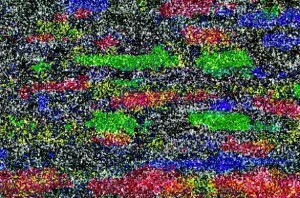 This is an image generated from a CMOS sensor noise test I did. You’re seeing individual pixels that had non-zero values in either the red, green, or blue channels. They should all be black (zero value in each of the R-G-B channels) but extremely low signals are almost always present (called noise). The procedure I ran forced these tiny differences to be exaggerated greatly so they could be easily visualized. This is a 586×386 section of the much larger sensor array and it shows that the noise is not exactly random but has some patterns to it. Noisy image. Click for larger image. 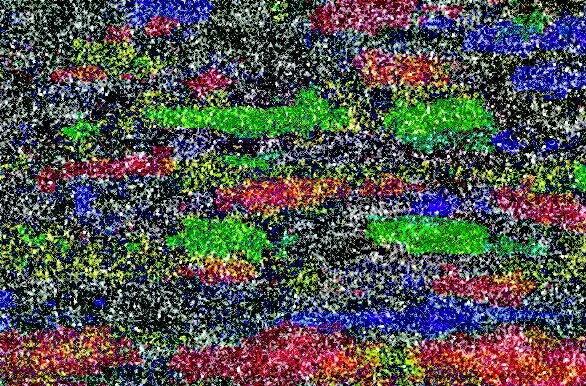 So, what does normal noise look like in images? 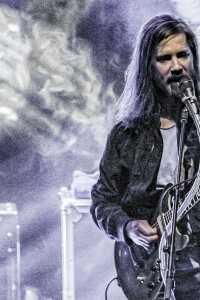 Take a look at this cropped section of a larger image, snapped at a concert. The lights were lower than the usual low and mostly from behind the subject. The noise is what’s causing the grainy look throughout much of this image. There are ways to remove the appearance of noise but the best way to combat noise is to not get it in the first place. Easier said than done, especially when you are forced to shoot in low light situations. Fast lenses, slow exposures, full frame sensors, and external illumination are about all that you can turn to minimize the effects of noise when you don’t have enough light.